Mom, the Intern: What's new with the gestating lady? What's new with the gestating lady? So, I'm pregnant. No secret there! I've just hit the 25-week mark. I have to say, this pregnancy has been significantly easier than my last two. I basically feel ... normal! Sure, there are the occasional aches, pains and mild discomforts, but no serious complications or anything. It's been a blessing. I hate to take credit for anything because I know plenty of moms who do everything right and still wind up with miserable pregnancies. But, I did start this one on a much healthier foot than the past two. For one, I was in great physical shape when baby was conceived. My hormones were all in balance. I had also cured my reflux through proper diet management. I was fully ready to incubate a baby and that has made a huge difference for me. If there was any way I could control the awful morning sickness (and vomiting) I usually get when I'm pregnant, I was willing to try it. Prior to conception, I had read some anecdotal blog posts stating that taking daily magnesium supplements can help with morning sickness, so I decided to give it a whirl. Why not? It's fairly cheap and easy, and if it could spare me from having to worship the Porcelain Goddess every day, it was worth it. I took the recommended daily dosage and ... I think it may have helped! I was nowhere NEAR as sick as I was with my first pregnancy (also a girl). I still suffered through it at the beginning of this one, puking and all, but it started around the 6-week mark and ended around week 10 (much shorter span than in the past -- praise be!). I was even able to stomach my prenatal vitamins which I could almost never keep down before. It could have just been good fortune or a blessing from heaven, that's true. But I religiously took magnesium and my morning sickness wasn't bad this time, so I'd say it was worthwhile. I also read here that besides possibly helping quell mom's nausea, extra magnesium is also highly beneficial for that developing babe within. Having a history of acid reflux, I already sleep on a wedge, drink tons of water, stay away from hard-to-digest foods and try not to eat late at night. Having a small human squishing my innards means I need to be even more vigilant about these things now. Of course, during the holidays I broke my eating rules plenty of times (a little too many non-alcoholic egg nog night caps) and I suffered alllllll night for that. Tums and Zantac save me when I'm naughty. I also bought a Hurom slow juicer to incorporate a little fresh juice into my daily diet. Juice is so easy to digest and gives my poor gut a break. It's yummy and I have noticed a decline in my reflux symptoms just in the past week. As an additional benefit, avoiding refluxy foods (chocolate, fried foods, red meat and sugars are the worst) has also prevented me from gaining too much weight, which makes pregnancy harder on my body. My frame is small so every extra pound takes a severe toll on my joints if I'm not careful. I still can barely resist a Reese's peanut butter cup (or seven) to save my life, but when I know it's going to haunt me in the form of wicked heartburn later, I'm less likely to indulge. Speaking of joint pain ... one thing I was most nervous about this go-round was the dreaded CROTCH PAIN, otherwise known as symphysis pubis dysfunction. I had it BAD with my first two. Imagine feeling like someone has kicked you in the crotch with a steel-toe boot about two dozen times -- that's what SPD feels like. It makes even mundane tasks like rolling over in bed or putting on pants excruciatingly painful. And you can just forget grocery shopping! In my quest to learn how to avoid it, I read this article on Babycentre (the fancy version from our friends across the pond). Turns out pushing a "trolley" or shopping cart it is one of the worst things for crotch pain! No wonder I suffered most on Saturdays after my weekly grocery shopping trips. Dill has since taken over that chore for me so I don't have to push a cart and further aggravate the crotch pain (trust me -- it's a win for him if my crotch doesn't hurt. Just sayin'). I must say, I do still get twinges of pain when I put pants on, but for the most part my crotch is doing fine. So, if you get this pain, stay AWAY from strollers and shopping carts while pregnant! And read the above article (just make sure you have a nice Downton Abbey accent going in your head as you do). But, I do try to stay active! I do 10 body squats in the morning and 10 more at night to keep my legs strong. I play with my kids and walk outside with them whenever I can. I chase Carson around, mostly out of necessity. I do housework on a regular basis. I try to take my stairs at a brisk pace when I use them. I have dance parties with the kids. So, you know -- I haven't become a useless lump yet. Emphasis on the "yet" part since I still have 15 weeks to go. 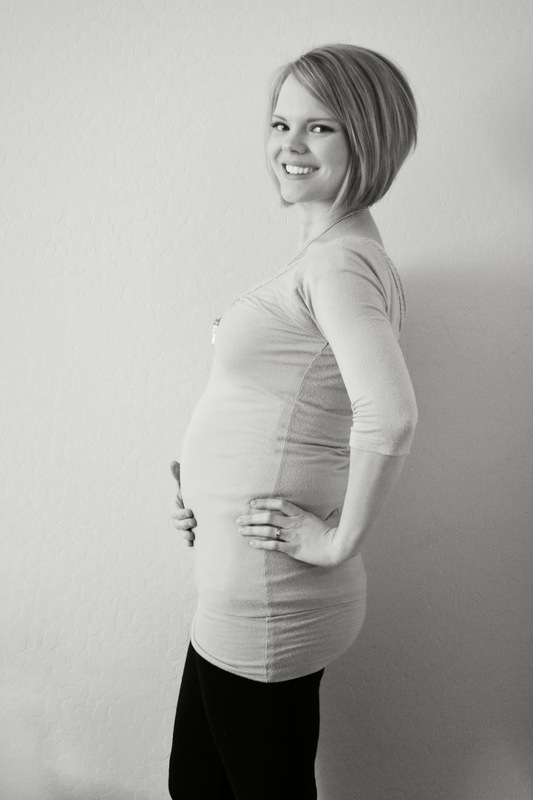 My first pregnancy brought on so many physical changes, many of which will never be erased by time. Widened hips, stretch marks and blown-out veins, for starters. I know a lot of this can be attributed to an -- ahem, irresponsible amount of weight gain (I was obsessed with the pastries from the BYU vending machines, OK? ), but even when you do everything right, growing a baby changes your body. And that's OK! By Baby #2, I learned to embrace these changes and love my wonderful, miraculous pregnant self. I take regular pictures of my bump, slather myself in luxurious body butter every night, got a cute haircut and found some fun clothes to dress up the growing bump. I love what my body is doing -- creating a little life inside me! I try to celebrate it any way I can. They say attitude is everything. Yep, if you're pregnant, you're probably going to get stretch marks and veins and you'll probably never fit into your high school jeans again. It's just a fact of life -- open up your arms and give your new, evolved self a big hug! You're so cute, Andrea! I love the way you are so positive, keeping track of things with your chalkboard pics!